When visitors stroll through the exhibition areas of the Pro Football Hall of Fame, they soak in about one-third of the Hall of Fame's collection. The other two-thirds is stored and cared for in the Archives. Here's a look at the Hall of Fame's vast collection of three-dimensional artifacts. 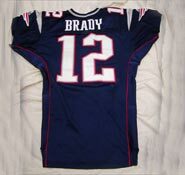 New England quarterback TOM BRADY sent his Super Bowl XXXVI game jersey to the Hall. The jersey has been added to the HOF's Super Bowl Experience exhibit. Brady was named the game's Most Valuable Player following the Patriots victory. 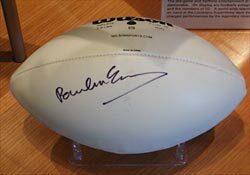 Hall of Fame musician PAUL McCARTNEY signed this commemorative Super Bowl XXXVI football. McCartney entertained a worldwide television audience as well as those on hand at the Louisiana Superdome in New Orleans. The ball is on display in the Hall's Super Bowl Experience exhibit. 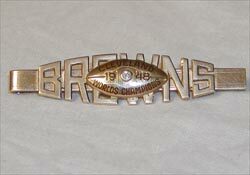 Hall of Fame coach PAUL BROWN spent many chilling afternoons on the practice and playing fields in Cleveland during his tenure as the Browns head coach from 1946 to 1962. 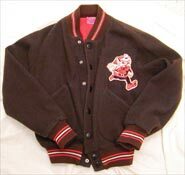 Brown's wife Mary recently presented the Hall of Fame the sideline jacket worn by her husband and the coach's 1948 championship tie clip. 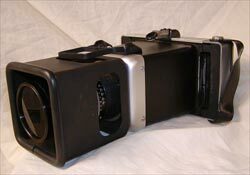 Hall of Famer WELLINGTON MARA used this modified Polaroid camera to take photos of the opposition's defense from the upper deck at Yankee Stadium in the 1950s. The results were stuffed into a sock that was then weighted and sent down on a cable to the sidelines where defensive coach Vince Lombardi would analyze the photo. 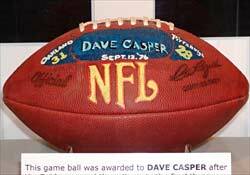 Class of 2002 inductee DAVE CASPER earned this game ball following the first start of his Hall of Fame career. He caught 7 passes for 124 yards and two touchdowns in the Raiders win over the defending Super Bowl champion Pittsburgh Steelers on September 12, 1976. Oakland scored three times in the final three minutes of the game to win, 31-28.